Tools needed are: cordless drill & batteries, mallet, 2 1/2 or 5 gal. food grade bucket + lid, 1/2″ handmade copper spiles 3″ long, utility knife, approx. 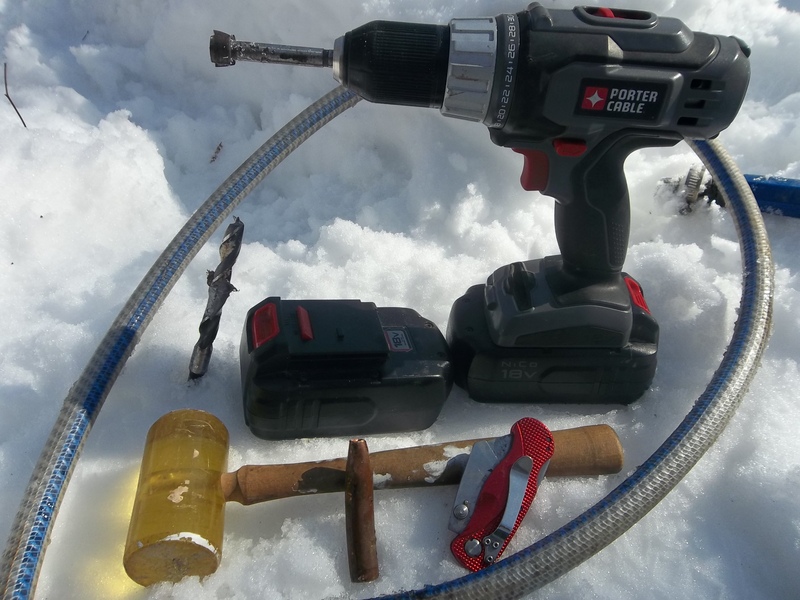 3/4″ OD garden hose, 3/4″ forstner bit, 1/2″ brad point bit, & optional duct tape (in case a line needs adjusted to flow properly down hill. The spile, to make it. Deburr it. Lay the cut pipe (diamond pattern as described) on the anvil part of your vise. Take the claw part of a straight claw hammer & pound one side of the cut as you roll it. So it is below the other side that is still round. Now just roll & pound so it looks good. Now if they are need boiled, do so. 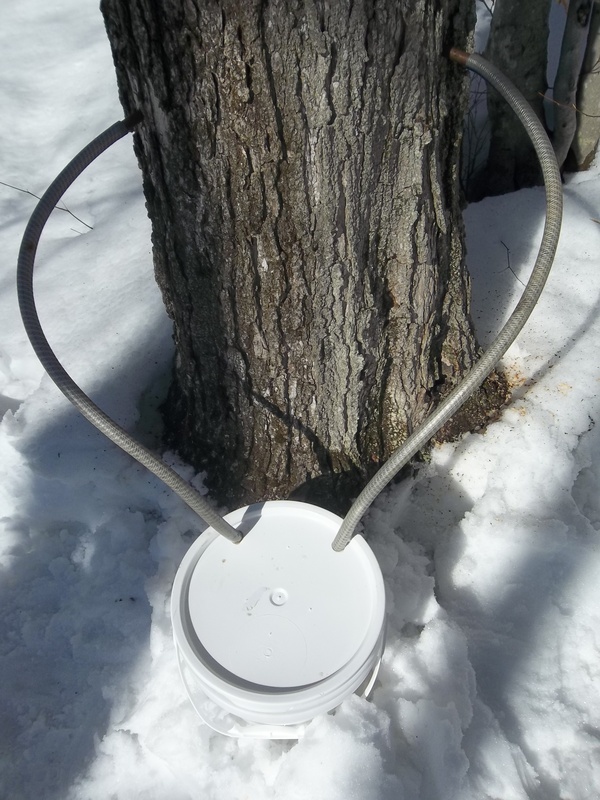 Drill 3 holes in a large/medium tree. 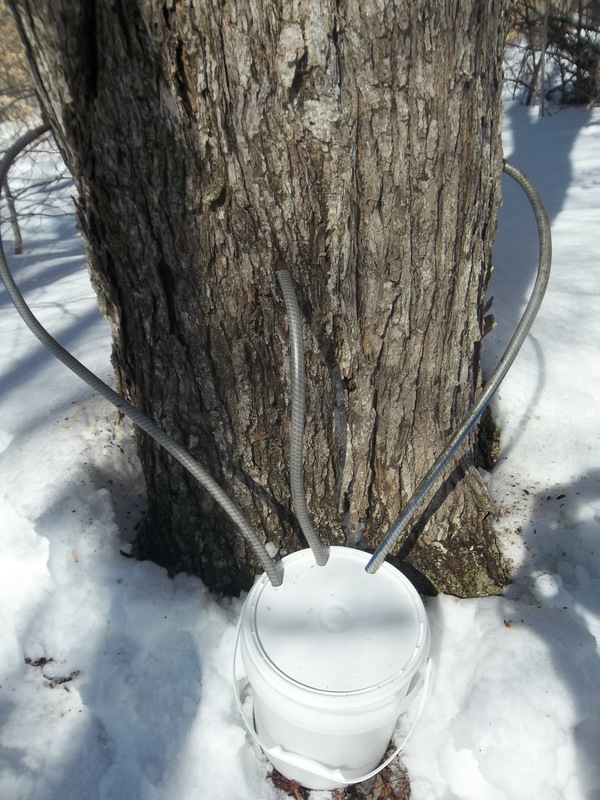 Hard maples produce sap with a slightly higher sugar content. Drill 3/4″ holes as needed with a forstner bit in the bucket lid. Drill 4 holes for a giant tree. 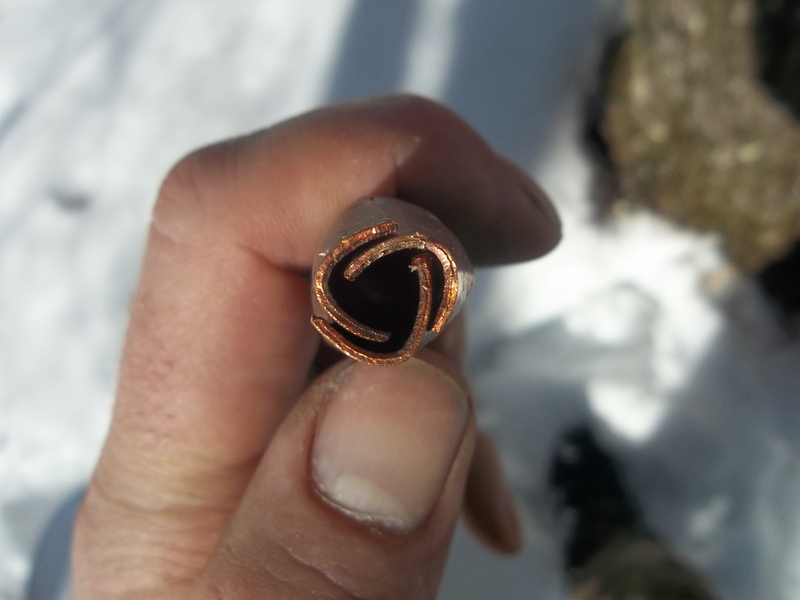 When you drill, be careful not to tear bark off or do any damage besided the drill hole. 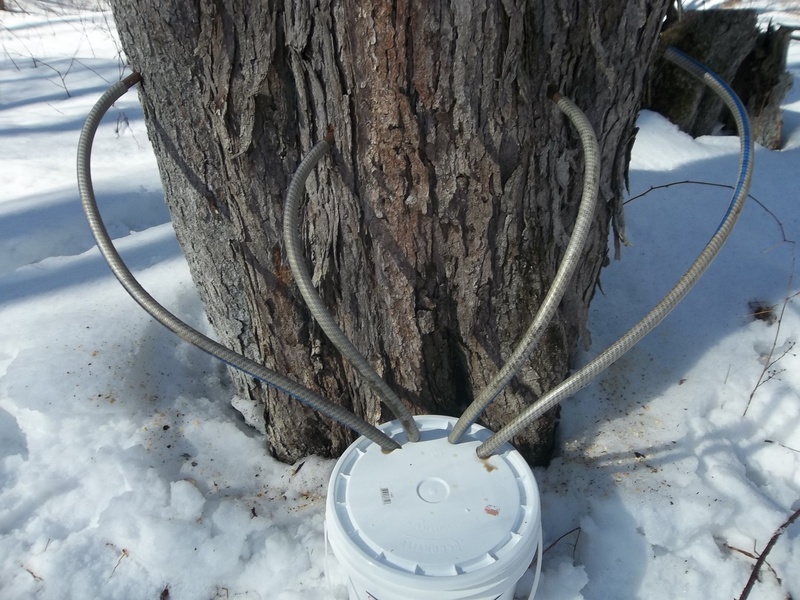 You will lose sap if you do damage. 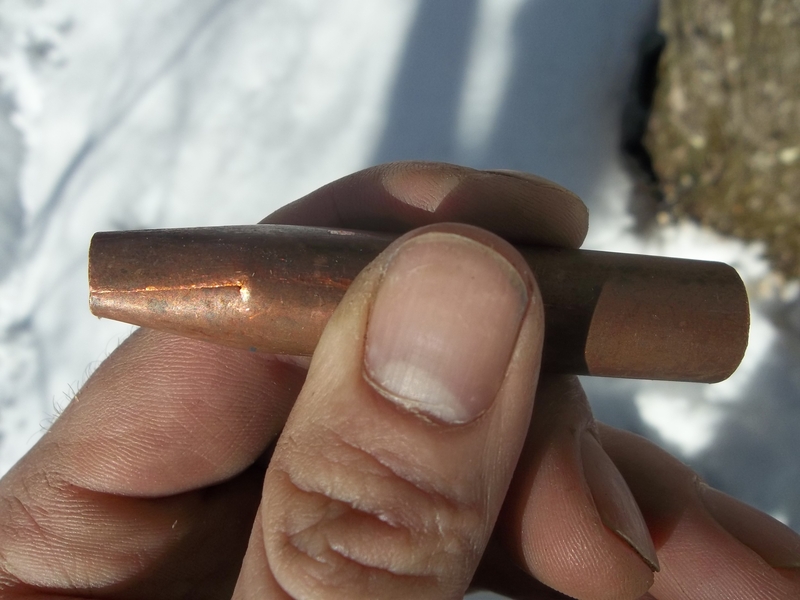 1/2″ ID x 3″ copper spile. To be made use a hacksaw & put the 3″ tube in your vise. Now make cuts in a triangle formation. Go as deep as the blade + 1/8″.